Dr. Hassan Khalil will talk about bone health during the inaugural EMHS Walk with a Doc program on Monday, April 8, 1-2 p.m., in the EMHS parking lot. There is no charge to participate. Walks will be held every month through November. Endless Mountains Health Systems is encouraging local residents to take a step toward better health with Walk with a Doc, a health program that brings doctors and patients together to walk every month. Walk with a Doc is a national non-profit organization whose mission is to encourage healthy physical activity in people of all ages and reverse the consequences of a sedentary lifestyle in order to improve the health and well-being of the country. EMHS has partnered with Geisinger Health Plan to bring this program to Susquehanna County. “This program has had tremendous participation and success in hundreds of cities around the country,” said Ihab Dana, M.D., a Physician at EMHS. The Walk is open to the community. Participation is free and pre-registration is not required. Walkers will enjoy a refreshing and rejuvenating walk with a member of the EMHS Medical Staff and other healthcare professionals, who will provide support to participants and answer questions during the Walk. The kickoff Walk is scheduled for Monday, April 8, 1-2 p.m., at EMHS with Hassan Khalil, M.D. who will speak about Bone Health. Walks are scheduled every month from April through November at EMHS. The complete schedule is on EMHS’ website, endlesscare.org. “Walk with a Doc is honored to team up with EMHS. 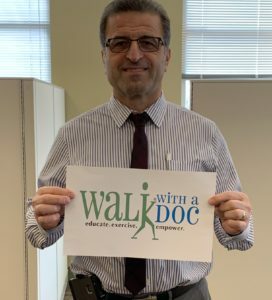 By incorporating this program into the practice, EMHS is demonstrating an exceptional level of care and commitment to their community,” said Dr. David Sabgir, founder of Walk with a Doc. EMHS joins a growing list of communities nationwide that have started local Walk with a Doc (WWAD) programs. WWAD was created by Dr. David Sabgir, a cardiologist with Mount Carmel Health Systems in Columbus, Ohio. He has walked with patients and community members every weekend since 2005. Be the first to comment on "EMHS launches ‘Walk with a Doc’ program"